Want to use social media to help keep them that way? Giving people an awesome experience on social media increases customer satisfaction and builds long-term loyalty. In this article you’ll find five ways to improve your customers’ experience with social media. 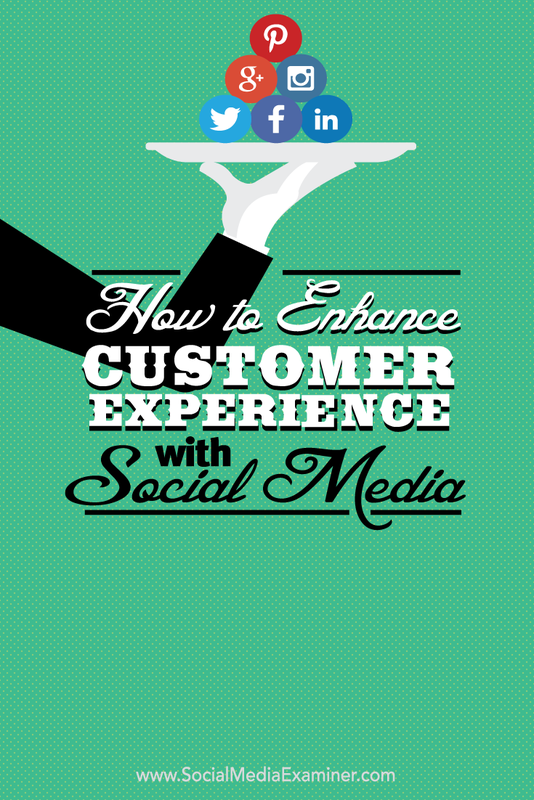 Discover how to enhance your customers’ experience with social media. To keep your customers happy and gain a true edge over the competition, be sure your customers know they’re seen and appreciated. Proactively reach out to fans and followers on a regular basis. Make your message truly resonate by keeping it personal. 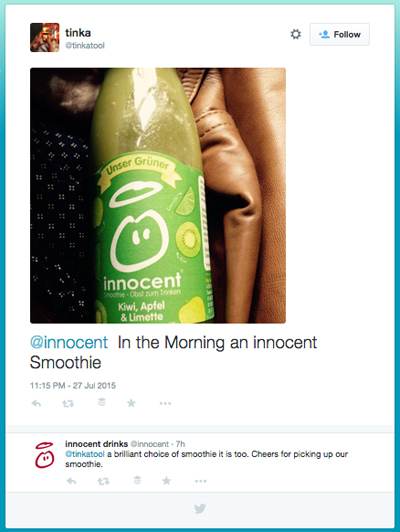 Innocent Drinks has more than 200,000 Twitter followers, and they take time to reply to and retweet fans who mention them. Replying to your customers on social media when they mention you makes them feel special. A treat is a great method to show your customers gratitude. Do customers regularly order from your web shop? Send them a thank-you note on social media. You can even offer them a small incentive, such as a personalized discount on their favorite items. While this will boost traffic to your website, your customers’ happiness level will get an even greater lift. Since the rise of social media, it’s become a lot easier to reach out to customers and incorporate their preferences into your products and services. Your fans, especially your brand advocates, love to share their thoughts on their beloved products. So give them something to chime in about. One of the easiest, most straightforward means of asking for fan feedback is to create a short poll. While asking these kinds of questions on your website might be distracting for fans, social networks are the perfect arena for them. When you stay in touch with your customers on social media, it’s easy to see what does and doesn’t resonate with them. General Mills learned through listening to their customers online and monitoring the right keywords on social media that families weren’t just cooking with Pillsbury Dough. They also use it to make shapes and designs for fun as a family activity. By studying these insights, General Mills revitalized their brand and started focusing on the product’s family activity value. This Pillsbury Dough holiday commercial is true to the brand. General Mills noticed customers were also using their products for family activities, and incorporated that into their branding. 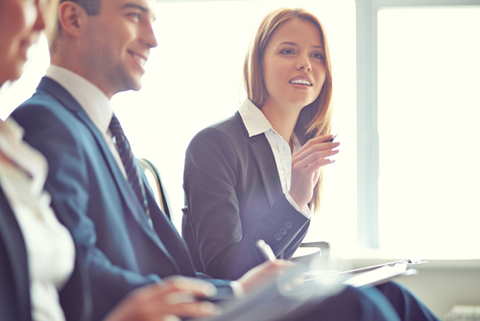 Gathering feedback is key, but it’s meaningless if you don’t do anything with it. Create a document or spreadsheet with all customer feedback, and then separate suggestions and complaints. Integrate the suggestions, deal with complaints (see #3), but also add them to your document so you can keep track of successful ways to handle them in the future. Review customer feedback regularly and integrate it into your brand activities. Another way to keep customers happy and show them you care is to solve any issues promptly, whether it’s a question or complaint. That means constantly monitoring social media accounts so you can see comments and reply as soon as possible. Set up a unique company policy with a step-by-step program to showcase how you want to handle complaints. Also, depending on the type of business you’re in, decide how to rectify certain situations. For example, if someone is unhappy with your service, do you give a refund or a discount? Take it a step further and try to understand why your customer had an issue or question to begin with, and keep track of how frequently he or she contacts your business. When you make an unhappy customer into a happy one, you typically get a brand advocate as a result. Your customers’ patience, and the customer experience in general, gets challenged the most during problem times. Image: Shutterstock. Also, if your business finds itself in a social media crisis, no matter what the type or source, own up to it and address it immediately. Your customers’ patience, and the customer experience in general, gets challenged the most during problem times. Identify keywords and set up alerts to stay on top of the situation. Direct customers to an online crisis center with useful links for up-to-date information so they feel cared for and in the loop. A social media crisis is the moment of truth for any company. It can either make or break your business, so take it seriously and take care of it. If you want your customers to be happy, start by keeping your employees happy. Create a company culture that makes your employees feel special, because they will pass on that attitude to your customers when they interact on social media. While the voice of the customer is incredibly powerful, it’s your employees who are the voice of your brand. Create a company culture that makes your employees feel special, and it spreads to your customers. Image: Shutterstock. Show your employees your respect and appreciation, and genuinely care about them. Listen to their requests and suggestions, reward them with a prize or a bonus when they meet a certain target and establish clear goals to keep them invested in your company. Treat your employees just like you would treat your customers. An engaged and happy employee is an employee who will serve your customers well. Since social media is now people’s primary form of contact with brands, it’s more important than ever to be on top of your social media presence. According to a survey by Bain & Co., 89% of companies expect to compete primarily based upon the quality of the customer experience they deliver. Customer experience is invaluable in improving customer satisfaction. Be good to your customers, listen to them and they will be loyal to you and your brand. What do you think? 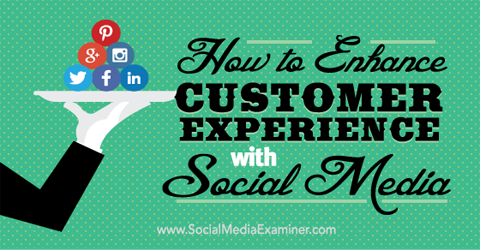 What have you done to improve your customer experience on social media? Which tactics have proved most valuable? Share your thoughts and recommendations in the comments below. Customer service photo and Business woman photo from Shutterstock. 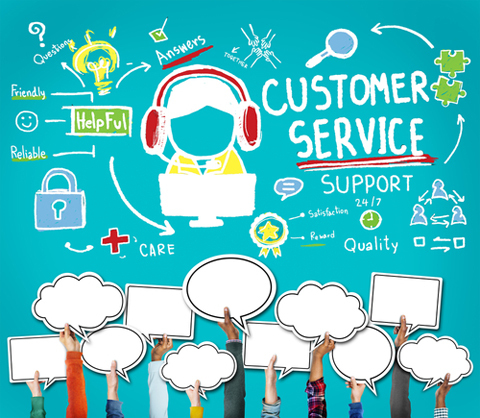 Tips for enhancing your customer experience. Sofie is Community Manager and Content Specialist at Engagor, a customer engagement platform. She helps brands to implement social media in other disciplines such as customer service and CRM.